This is what makes a champion side and don’t Pakistan know it. In 40 overs Australia re-taught their opponents the lessons of four days in Sydney from earlier this year, the moral of which remains that till the precise moment Australia are out, they are never out. Pakistan were on top for three days in Sydney, and 39 overs here, but Australia hunted away, gripped in, stuck at it. And with one ball to go, they pulled off an astonishing chase of 192 to enter Sunday’s final, leaving on Pakistan the deepest kind of scars in an already abusive relationship. On this form, England needn’t bother turning up. Man, I wish I had have seen this. I’ve not been a big fan of T20 cricket but I’m warming to it. Not hard with matches like this one (I’m watching the replay now). Possibly the best ever T20 match to date, and certainly the best ever run chase. I may rattle on sometimes about how good the Australian cricket team is, but it’s easy to understand why. Their greatness lies not in the spread of talent, which is exceptional, but it is rather their spirit and undying belief. They are champions because they win against the odds, again and again. There is always someone putting their hand up. At different times different parts of the team have fired, and in many games this tournament all aspects have been dominant. Last night the bowlers where smashed around the ground for the first time this series. Then the top order failed chasing the biggest target thus far, and in the semi-final. Looking down the barrel Cameron White kicked started things again and then, extraordinarily, Mr Cricket (Michael Hussey) came to the rescue. This is a game Australia should have lost. They just refused to, like so often. Hard to see them beaten from here, but there’s no room for complacency. Get over England and celebrate then. In the meantime, all credit to the Aussies – they’re titans of the sport. Having spent a lifetime watching Australian cricket I have come to recognise it's prime characteristics. You can count on a committed effort in the field, the batting aggressive, the fielding athletic, the bowling hostile, the attitude unrelenting. I doubt any of our rivals would dispute that. I've been witness to a great era of success that has bordered on dominance. I'm old enough to remember the great West Indian teams of the eighties, but what was fleeting success for them has been sustained by an Australian team from one generation to the next. Looking back over the last 20 years Australia has probably won about 70% of all the contests they've been in, a great rate when you consider that cricket is one sport where draws are a frequent occurrence. When they've won it seems to me they've won in one of two ways: dominating from start to finish and cantering away; or overcoming a tough opponent, a difficult situation, gritting their teeth and fighting to the last. Some teams lose games in those situations; Australia wins them. Today I watched the final of the U19 Cricket World Cup from New Zealand. Australia were playing Pakistan. Australia has won this twice before, but it's never really been big in the public's consciousness. In an interesting article today Peter Roebuck made the point correctly that in the Australian mind winning a junior tournament is nice, but it's really the grown up stuff that counts. To a degree that has been the cricketing administrations view also: they were quoted going into the tournament that the first priority was to develop players who can progress to the senior team in years to come. The trophy would be nice, but this is all about the future and ensuring the success of our senior team continues far into the future. That said you always want to win, and no kid walking onto the ground today would have had any other thought than that. In the end it was a very good, tight game. Australia batted first and struggled along to a mediocre score, but kept going when they might have been bowled out. Pakistan looked good early but then Australia in their inimitable way put the screws on with excellent fielding, smart bowling, and astute captaincy. As the game went on the screws were further tightened as Pakistan slowly lost their way and succumbed to the pressure. In the end Australia comfortably won a match they should have lost, very much in the manner of the senior team. Now they have the trophy that's the end of that team. They'll go back to their states and make their way, progressing individually or falling away. One thing is certain that there are players we saw today who will one day play test cricket for Australia. For me their are two leading candidates. Josh Hazlewood is six and half feet tall and was the match-winning bowler today. I think he's a special. In fact I think one day we'll be speaking of him in the same breath as Glen McGrath. The other is the skipper of today's team, Mitch Marsh. Son of a former player and the brother of Australias's one day opening batsman, I think Mitch Marsh is a good chance to captain the senior team too one day. Tall, powerful, aggressive, confident he possesses that intangible quality that separates the good from the great. If I was a selector I'd be inclined to fast track him because I think he's one of those rare players without limit. The harder you put it to him, the better he'll go. Other than those also impressed with Jason Flores, Luke Doran and Tom Triffitt , the wicketkeeper. The other one to remember is Darren Pattinson, playing for Victoria – in fact bowling stocks look pretty good. Look out for them. On a sort of related note I saw highlights last night of a match in the early nineties between the senior Australian side and Australia A, made up of the young up and comers. The senior side was good, the best in the world, and they beat Australia A on the night. 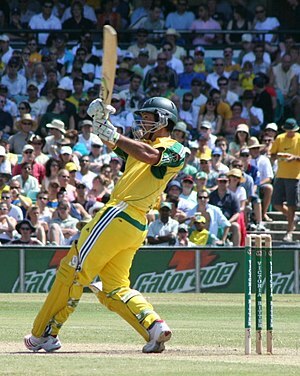 It was a good contest though, and fascinating to look back at the A team and those players who would bridge the gap and be integral members of what was to become probably the best team of all time: Ponting, Hayden, Martyn, Blewett to add to McGrath, Warne, the Waugh's in the senior team.